I was hungry. Really hungry. And I wanted something familiar, homey. And I felt brazen. So I made a fried egg salad. It sounded yummy. Comfortable and weird. What the heck, food is food. I grabbed greens, eggs, all the random veggies I had that made sense, and ingredients for a yummy honey mustard vinaigrette. I wanted tang and sweet — sharp cheddar, salty egg, delicious greens. It all sounded good. So I slapped it all together. Basic ingredients, ready for action. Egg and butter not depicted. 4 cups of mixed baby greens. 15 baby carrots, cut into thirds. 1 fistful of fresh italian parsley, chopped. 1 fistful of fresh chives, chopped. 2 T grated extra sharp cheddar. Freshly cracked pepper, to taste. 1 T red wine vinegar. 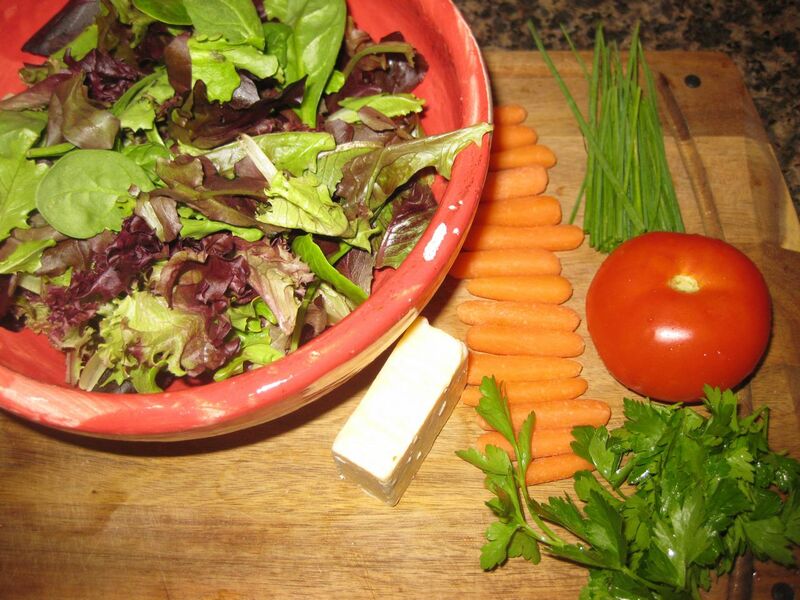 I made my bed of greens, and I chopped the carrots and tomatoes that would lie in it. I added my herbs. I mixed up my vinaigrette. And I put the butter in my ancient cast iron pan, and fried my egg, over medium, just like I like it. Cook the whites, leave the yolk super juicy. 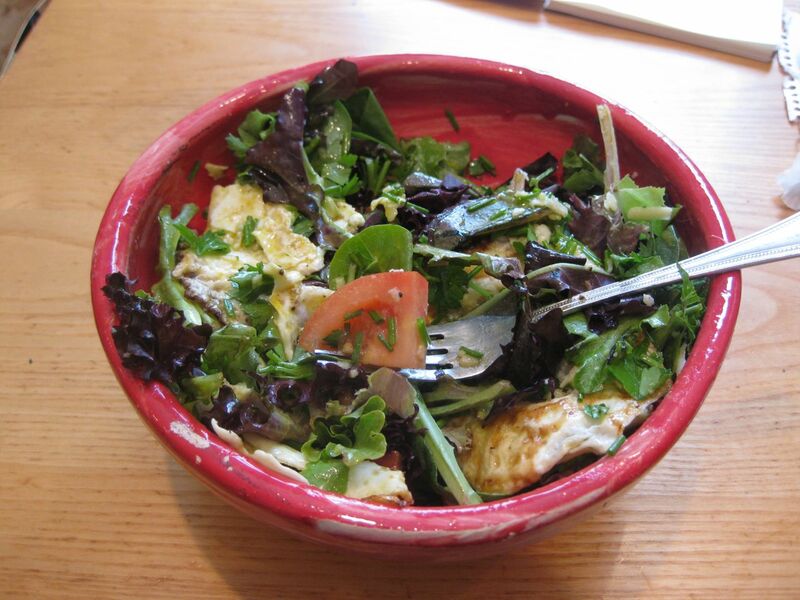 I tossed the egg on top of the salad, drizzled the dressing over it all, mixed it up with my fork, and gobbled it up. 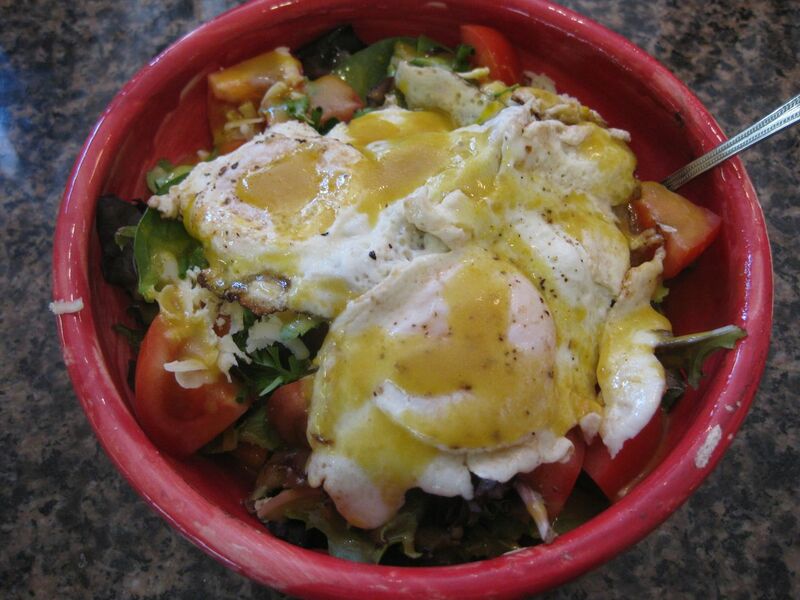 Here it is, dressing drizzled over the egg, all juicy and delicious and ready to be busted open. I loved this. So much. So much, it’s been hard to think of anything interesting enough to follow it up with. The cheese got a little melty with the hot egg. The chives added that delicious hint of oniony heaven. The egg… The juicy, delicious, amazing egg. The yolk mixed with the dressing and coated the leaves. The crispy edges of the egg whites added this beguiling crunch. The carrots helped crunchify it even more, while the tomato juices blended with the egg yolk and the honey mustard vinaigrette perfectly. This salad? This is exactly why I play in the kitchen. When it works, it works. And I don’t just mean that the recipe is perfect, I mean that what you really want, what you crave, is exactly what you create, and you get to eat it, and it is just, well, right. It was just right. This salad, it was exactly what my weird brain craved, and my mouth was happy, and my tummy was full, and it was perfect. Not going to happen. Sorry, but unless it’s easy for you to pack a raw egg and fry it at work (or wherever you eat your packed lunch) this one isn’t going to go anywhere. Eat it at home, where you have your fully functioning kitchen, and enjoy it.